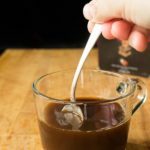 Learn how to make Vietnamese coffee easily with this step-by-step recipe! 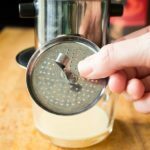 You need coffee, sweetened condensed milk, and a Vietnamese coffee filter. If you’re unfamiliar with Vietnamese coffee, it’s made in a single cup filter that balances atop your coffee cup. You can purchase the filter for about $5 at an Asian grocery store or online. For the coffee itself, I usually stick with Trung Nguyen brand (Trung Nguyen Gourmet is my favorite variety). You can also use Cafe Du Monde successfully, and in fact, it’s often sold in Asian grocery stores for that very purpose. 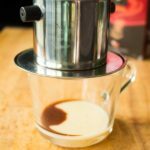 Vietnamese coffee is traditionally made sweet with the addition of sweetened condensed milk. 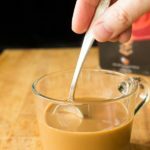 To get the full visual effect, you use a clear glass or cup, add a layer of sweetened condensed milk on the bottom, and brew the coffee directly directly into the cup. Once brewed, the coffee and the sweetened condensed milk are swirled together. You can drink it hot, of course, or you can pour the mixture directly over a tall glass of ice to make iced Vietnamese coffee. 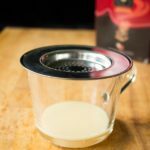 It’s easy and inexpensive to pick up the proper filter and coffee brands at your local Asian grocery store or at online retailers, so I encourage you to give the authentic version a try. 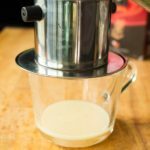 If you decide to make some Vietnamese coffee, let me know! I’d love to hear about it. One of the great pleasures in my life is an afternoon cup of Vietnamese coffee. Made hot or iced, this delicious beverage is well worth the inexpensive purchase of a special coffee filter. Place the coffee mug on a flat surface. 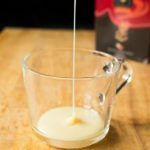 Pour in enough sweetened condensed milk to make a layer on the bottom of the cup. Top with the dish-like section of the filter. Place the cup section of the filter on top of that. 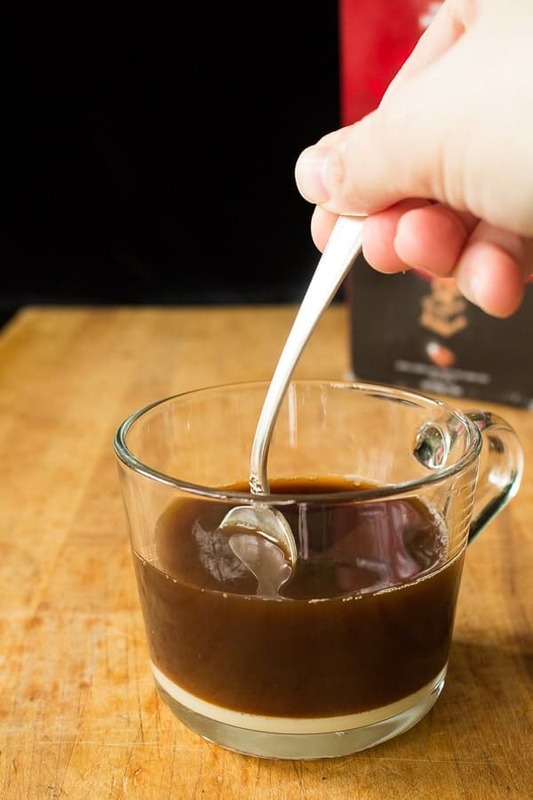 Measure out about 3 tablespoons of coffee (20 grams) and place in the filter cup. Put the filter insert on top of the coffee. Tap it down very gently and spin it a few times to level the coffee grounds. Add just a little very hot, but not boiling, water to the filter- just enough to moisten the coffee grounds. Wait 20 seconds for the water to soak in. Add enough water to almost fill up the coffee filter cup. Let brew for a maximum of 4 minutes. Let brew for a maximum of 4 minutes. 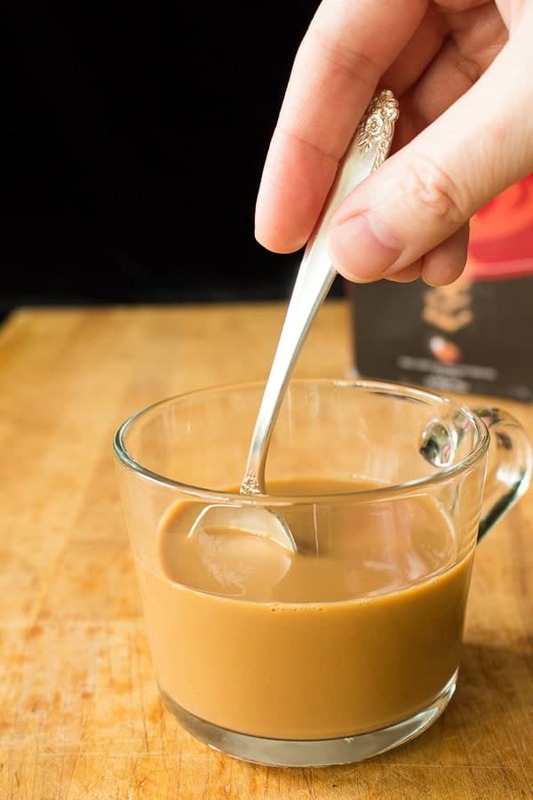 Stir the sweetened condensed milk into the coffee. Serve hot or pour over ice, and enjoy! This is so cool! I’ve actually not heard of Vietnamese coffee before, but this is definitely something my husband would like! Now that’s what I call a perfect cup of coffee. This sounds heavenly. I’ve heard of Vietnamese Coffee but have never tried it. I love that you showed the steps to make it, I would love to try it soon. Thank you! I thought it might be helpful, since it’s an unfamiliar process. Give it a try some time! This looks SO good! I’ve had Vietnamese coffee a few times & loved it. I have a friend who is totally addicted to this stuff. Now I can make it for her. This is fabulous!! LOL, it is totally addictive! I was not a coffee drinker at all until this stuff came my way. I LOVE Vietnamese coffee. I think I need to go out and get this filter so I can make them at home! 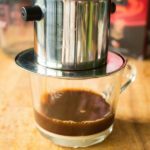 I also wrote Vietnamese coffee recipes and i think you like that. Actually i like your recipe. 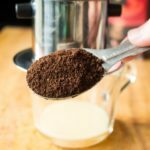 I noticed that the Vietnamese coffee brand has added ingredients.Do you know what they are? It has a warning on the box from the state of California. I didn’t see a warning on my old boxes of coffee. I wonder what that’s about?